The Neighbourhood Plan has now been finalised and is available for public consultation. You can view a copy of the Plan by clicking; Arne Neighbourhood Plan December 2018. We would ask you to complete a response sheet and return it my email to arneparishcouncil@gmail.com or via post to the Clerk at Rye Hill Farm, Rye Hill, Bere Regis, Wareham BH20 7LP or hand it back to any of the Parish Councillors. Response forms will also be available at the Consultation Drop In on Monday 14th January 2019 at Stoborough Primary School between 4pm and 8pm. Please remember, this is your Plan and it is important that you read it before it is passed to Purbeck District Council. This is all leading up to a Parish Referendum on accepting the Neighbourhood Plan later in 2019. Click here for feedback from Drop In Sessions on 21st & 22nd of June 2016. Click here for the December 2014 Newsletter which summarises the latest news about Arne Parish's Neighbourhood Plan. The results of the Arne Parish 2014 Survey which took place in September can be found in the Neighbourhood Plan Survey Report. A follow-up Information Evening was held on the 12th November to present the above survey report but also to carry out a straw poll of those present on preferences for any housing development. The meeting was held at Stoborough Primary School with over sixty residents attending. Arne Parish Council thank Ms D Corbin, Headteacher of Stoborough Primary School for the use of the school hall and its modern facilities. 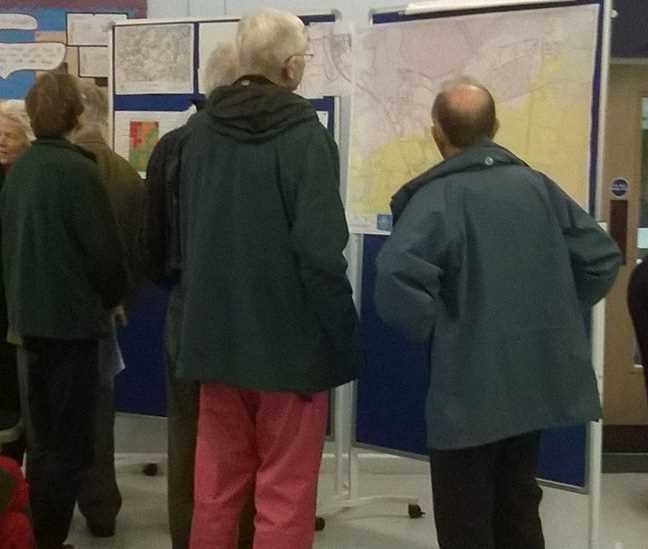 More than a hundred people from Arne Parish crammed into Stoborough Village Hall on the 24th April for the first open evening of the Neighbourhood Plan process on a fine spring evening. There was an introductory talk by Keith Childs from Purbeck District Council who described how neighbourhood plans fit in with current government planning frameworks. Then everyone took the opportunity to review and comment upon six different topic areas. These included housing, employment, education, recreation, health, transport and police and crime issues. Post-it notes were used to collect hundreds of ideas and opinions for further analysis. This will give the steering group plenty to chew over in the next few weeks.The session was chaired by Ashley Pellegrini and tea and cakes were organised by Stoborough WI. It was an enjoyable evening and a very encouraging start to the project. Click here to see the official plan of the neighbourhood plan boundary - this is coincident with the Arne Parish Boundary. "Arne Parish has a unique natural environment formed by past cultural, economic, social and agricultural practices. While recognising and protecting its heritage, we seek to ensure the long-term sustainability and viability of the parish through environmental and economic measures that will develop the community and its charm, so that all its residents, young or old, continue to live in a community in which they feel safe, cared for and happy". Our Neighbourhood Plan has to be produced in accordance with The Purbeck Local Plan which is itself under review - click here for full information. A series of drop in events around Purbeck have now concluded. A summary of Arne Parish Council's comments can be found here. Also an influence on the Purbeck Local Plan and Arne Parish Neighbourhood Plan is the Heathland Supplementary Planning Document Consultation. See here for full details. Arne Parish's response to this is here. If you would like to receive emails on progress with the neighbourhood plan please register on this website using the REGISTER tab on the top right of this screen. Minutes to Neighbourhood Plan meetings can be found in the DOCUMENTS tab on this web site.